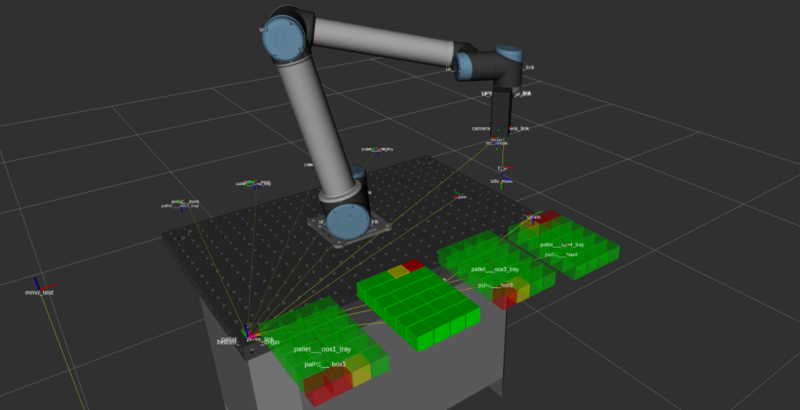 Although it can be considered a standard component in industrial robotics, ROS-Industrial lacks easy to use methods for working with batches of parts, i.e. to iteratively process or manipulate a number of parts in a fixed or dynamic pattern. In this project, we will develop an intuitive, open source and easily expandable alternative to commercial solutions to this problem – a Pattern Manager – for the benefit of systems integrators seeking to use ROS for their next robot installation. The Pattern Manager will contain functionality for easily setting up even complex patterns, through Rviz or configuration files. Multiple patterns can be grouped, and iterating through patterns is done through simple ROS services. Making use of tf, all robot motions can then be performed based on the current position in the pattern.